A United Nations disabilities advocate says “systemic change” is desperately needed after she toured Canada to review cases of people with disabilities, including a complaint from a terminally ill man who has been in a London, Ont., hospital while fighting to get self-directed care at home. “I am a patient barely who is barely hanging on to life and suffering enough with my disabilities,” he said. Foley’s case was one of several presented to Catalina Devandas Aguilar, a lawyer from Costa Rica and the UN’s first ever Rapporteur on the Rights of Persons with Disabilities. “Persons with disabilities have to initiate very lengthy and onerous legal procedures to get their rights recognized,” Devandas Aguilar said. In her statement, Devandas Aguilar said she was “extremely concerned” about the implications of assisted dying legislation on people with disabilities after hearing multiple complaints. “I urge the federal government to investigate these complaints and put into place adequate safeguards to ensure that persons with disabilities do not request assistive dying simply because of the absence of community-based alternatives and palliative care,” she wrote. Foley recently qualified to receive the home care he has long struggled for. Regardless, Foley’s brother, Rob Foley, said what his brother had to undergo was unfair. “He shouldn't have had to be in a hospital for three years and fight the way he’s had to fight,” he told CTV News. Foley’s lawyer, Ken Berger, agrees. “This is just wrong. It’s outrageous what’s happened to Mr. Foley and something needs to be done,” Berger said. And Foley isn’t alone. 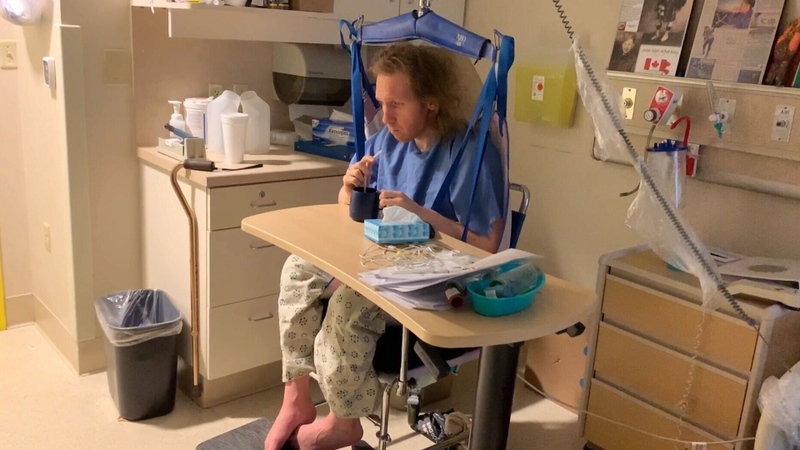 Sean Tagert suffers from advancing ALS and requires around-the-clock care, but he only gets 20 hours a day. He lives with his mother in Powell River, B.C., near his 11-year-old son, for whom he shares joint custody. Tagert’s mother, Patricia Mennittie, said her son’s struggle has taken a toll on the family. “We’ve done our best as a family to rise to those needs but we’re becoming exhausted,” Mennittie said. “This is about ripping him from his home and family and community and sticking him far away in a place where he will die alone,” said Rhonda Wiebe, co-chair of the Council of Canadians with Disabilities Ending of Life Ethics Committee. “Canada has to step up its game on this issue. It’s fundamental for all Canadians. It’s a big deal,” he told CTV News Channel on Friday. Specifically, Hansen said all provinces and territories should agree on “harmonized” rules and regulations to provide across-the-board standards for people with disabilities. It’s a principle Canadians already agree on, Hansen said. “One of the most important things is that if you poll Canadians, 92 per cent of Canadians are clearly behind this is a fundamental thing that Canadians with disabilities should have human rights embedded in this country and should have free access to every opportunity that everybody else has,” he said. Roger Foley suffers from an incurable neurological disease. He shared his struggle in an Ontario hospital with the UN’s first ever Rapporteur on the Rights of Persons with Disabilities.